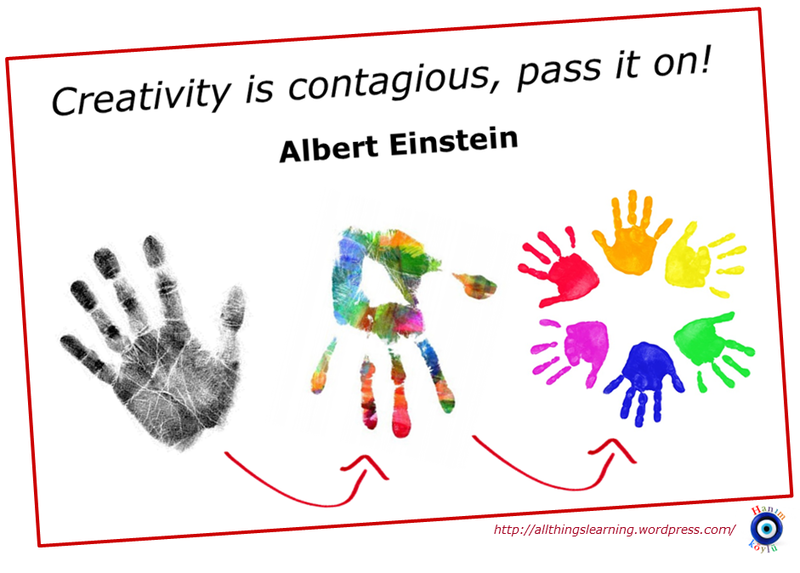 In the last post from Chaz, we looked at the concept of creativity: what it is, where it is and its role in the classroom. Chaz pointed out that, given the right type of motivation, everyone can be creative. 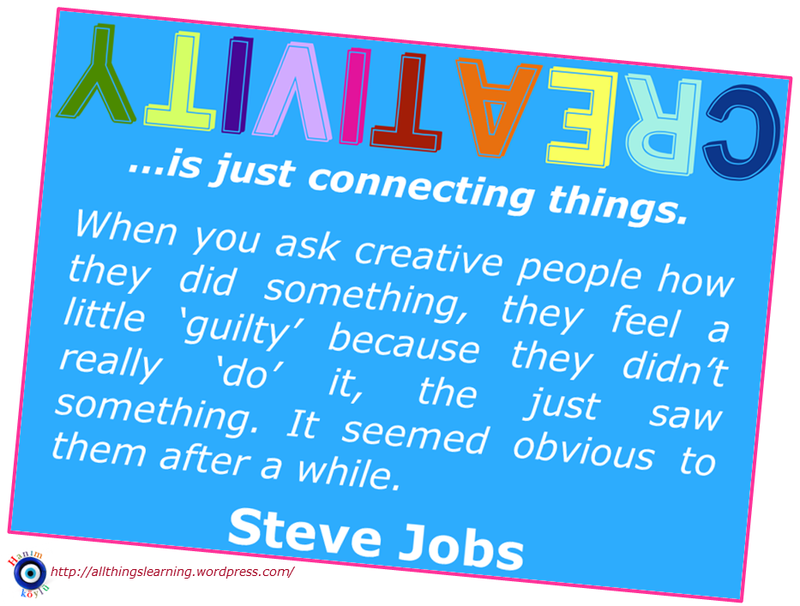 But creativity doesn’t just happen like that; it needs to be embraced, invited, nurtured and encouraged. In this second post, Chaz talk about three stimulating strategies he uses to boost his own creative potential. For each of these he provides a short outline and an example to illustrate how it can be implemented in the classroom. He also describes an activity teachers can use themselves to overcome blocks and fears and to unleash their own creativity. Keeping things simple in the classroom involves focusing on the learner rather than on the materials to be ‘covered’. Most importantly, to teach more simply is to teach more purposefully and with a minimum of needless distraction. If necessity is the mother of invention, then frugality deﬁnitely plays a big role in boosting our creativity. The simplicity strategy can be spectacularly applied in the language learning classroom – in activities that require little or no preparation time and which are designed to use the students as our primary resource. What you need, to put this strategy into practice, is some knowledge of who your students are as people, what they like and how they like to learn. The rest is down to some thinking, some work and, to a lesser extent, some inspiration. Preparation: Have some pencils and A4-size sheets of paper ready. Put the students into pairs and make sure they have a piece of paper and a pencil each. Ask them to draw each other’s portrait without ever looking at the paper. When they’ve finished, ask them to compare their portraits (this inevitably triggers laughter). The lesson can now start. Alternatively, and especially if the students don’t know each other very well, you can ask them to draw the same object in the classroom – again, without looking at the paper. Over the years I have found that using a touch of humour in the classroom is a great tool to diffuse tension and relax the students (and, often, the teacher). Think, if you can, of a life deprived of play. You give up? I don’t blame you. The ability to play is the capacity to have serious, purposeful fun. 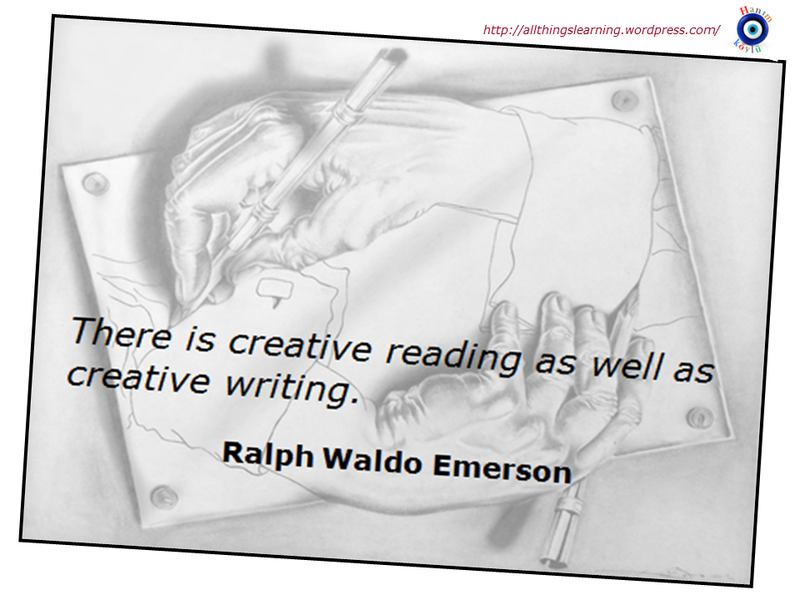 This is seen by many creativity researchers as an important step in the creative process. In the words of psychologist Mihalyi Csikszentmihalyi, ‘there’s no question that a playful attitude is typical of creative individuals … but coupled with its antithesis, a quality of perseverance and endurance’. As early as the 16th century, Erasmus and Montaigne both recommended games as mnemonic devices, and recently Guy Cook has explained how play has a cognitive function that supports and fosters creative thinking. A playful attitude is important in the classroom because it helps the teacher create a stress-free environment, and is essential because it allows us to pay heed to the child within us that is still longing to be creative and playful. We can approach self-expression with a greater sense of balance and, in some cases, with renewed enthusiasm, making it easier for our creativity to flourish. Preparation: None, as such, beyond keeping an eye open, as always, for the best time to do it. 1.Ask the students to work in pairs. 3.When they are ready, ask the students to form new pairs and to teach each other their new languages. Risk taking is about getting out of one’s comfort zone. Charlie (‘Bird’) Parker is one of the most inﬂuential jazz musicians who ever lived. The ﬁrst time he played in a jazz club, he got booed off the stage, and the drummer even threw a cymbal at him in sheer anger. Parker’s sin had been to venture into new territory: he wasn’t interested in playing mainstream music, and that’s the risk he chose to take. He persevered and contributed to the birth of a whole new chapter in the history of jazz. Bird was prepared to be wrong; he had the guts to challenge the establishment, and that’s perhaps the lesson for all of us: creativity takes courage. Taking risks doesn’t come naturally to a lot of us; it makes us feel uncomfortable and edgy. This comes from a fear of being wrong. As children, we feel free to experiment with reality and we don’t care about the results. 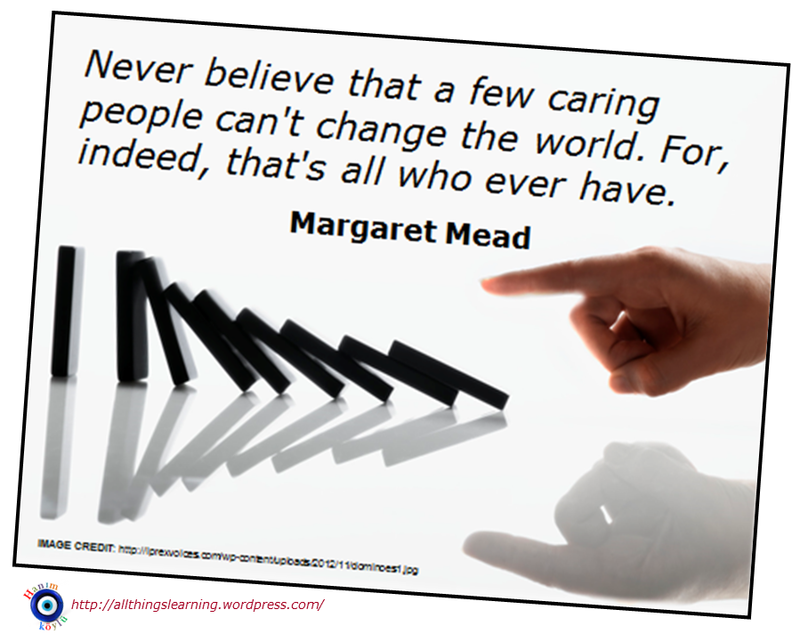 By the time we are adults, we lose that capacity and become frightened of doing things differently. This is largely because we stigmatise mistakes. 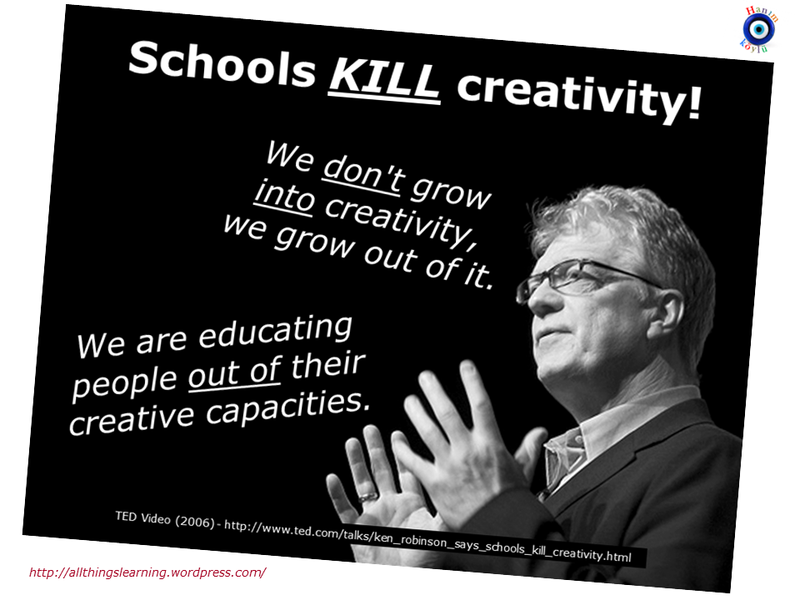 So, what we do, according to Sir Ken Robinson, is to ‘educate ourselves out of creativity’. However, there is only one alternative if you don’t want to take risks, and that is to play it safe – to give in to the sirens of routine, an approach which never really pays dividends. 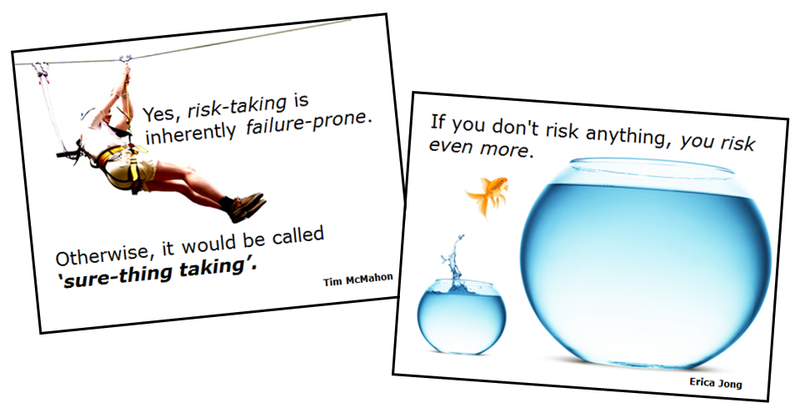 Risk taking in the classroom is about assessing the situation, daring to try different approaches and entering the discomfort zone. The outcome won’t be spectacular at ﬁrst, but taking risks is a necessary step if one intends to engage oneself seriously on this path. Preparation: You will need a set of pictures of works of art. 1.Put a collection of pictures of works of art on your desk. Invite all the students to come up and pick one picture they’d like to do some work on. 2.Ask them not to show their pictures to anyone. 3.Put the students into pairs (A and B). Explain that the As are going to describe the opposite of the picture they’ve chosen, and that the Bs should draw or write (see the Comment below) the opposite of what they hear from the As. Thus: If A says: ‘In this painting there’s a cat sitting in a tree’, B may draw or write: ‘The monkey’s eating a banana’ or even ‘There’s a dog sleeping on the sofa’. 4.Give them a good ten minutes for this. When they’re ready, ask them to check B’s picture or description against the original. How close did they get? 5.Invite the students to exchange roles. The idea of an ‘opposite’ is naturally very subjective, hence there’s an element of creativity that makes the activity more engaging. It is important to provide the students with options. Some may prefer to write a description, others may like to draw. By giving them a choice, hopefully the activity will more inclusive. Not a single person I have met ﬁnds it easy to nurture and unleash their creativity. 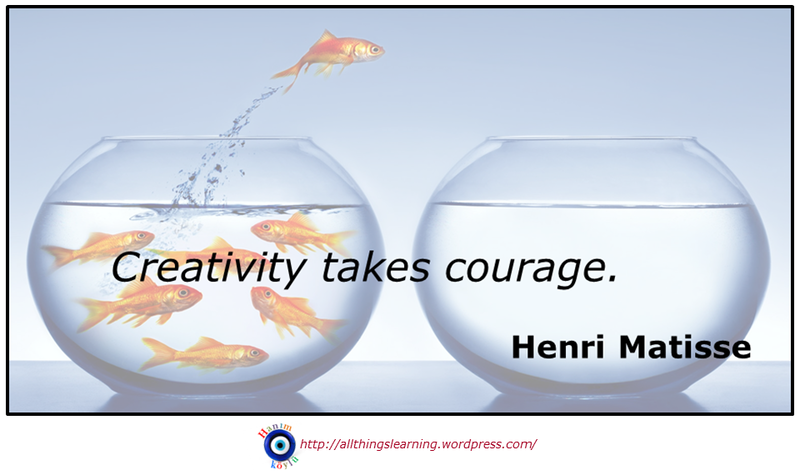 As teachers, we have to deal with all sorts of fears that may keep us from being creative, including fear of change, fear of accepting failure, fear of rocking the boat, fear of standing out, fear of disappointing and fear of uncertainty. Working in an environment that doesn’t value creativity is another huge mountain to climb. Having worked with hundreds of teachers on creativity courses, I know from experience that discovering that we can actually begin to create is the real trigger. There are no magic wands and no easy tricks, but please try the activity below. It is easy and powerful, and it should get you started. Remember two things: that there is no such thing as right or wrong and that you need to trust the process. The same exercise can be done using pictures. Visualise a picture you’re familiar with and, when the image is clear, change its colours, add or eliminate features, etc. Remember to experiment and to let your imagination run free. It is the process that matters: you may feel particularly proud of the end product – or not! 1.Take a few moments to relax, unwind and ‘gather attention’. Feel every muscle in your body relax and let your breathing become even and deep. 2.Now visualise a piece of music you like: anything, a song or an instrumental piece. Play it in your head. Play it loudly, as if someone were performing it in front of you. 3.Focus on the details. When the image is clear, change just one feature of the music. For example, change the tempo from slow to fast or from fast to slow. 4.Now change another feature in your imagination. For example, hear different instruments performing the music. 5.Keep changing the music as ideas spring to mind until you hear a whole new different piece of music, something neither you nor anyone else has ever heard. 6.Be as daring or as subtle as you wish, but allow your mind room for something new each time. 7.What does the creative experience feel like? Take some time to think about this. 8.Make notes and share with a partner or discuss with your colleagues – according to the possibilities of the situation you are in. 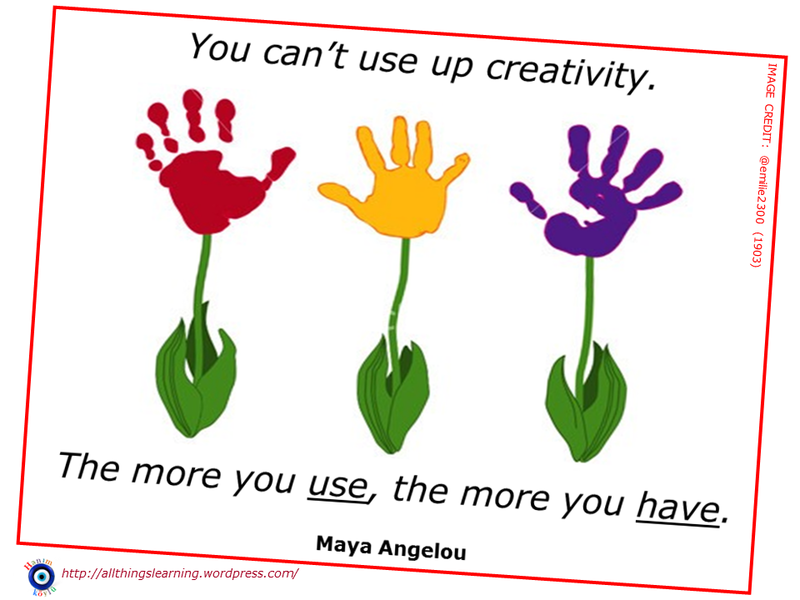 If you want to learn more about creativity, why not take a look at Chaz’s book – “Being Creative: The Challenge to Change in the Classroom” (DELTA, 2010). ALSO, in case you want a bit more BEDtime READing – check out Tony’s CREATIVITY Library ! Now, tell me if you can’t find 3 (or 6) books there to keep you going! We’ve all asked ourselves that question, haven’t we? I know I have…still do – every day! Today, we have a guest post from Chaz Pugliese, a teacher-trainer and musician (he plays a mean blues tune or two) based in Paris. Chaz and I met in Istanbul a few months ago and when I learned his “passion” was allthingsCREATIVITY – I just had to ask how he felt about allthingsBLOGGING! I’m glad I did. Take a read – feel free to contact him at chazpugliese@gmail.com. We live in a culture that doesn’t encourage us to be creative unless there’s a chance we are going to strike it big with a commercial hit. Creativity, like so much else in our world, has been co-opted into consumerism and its worth calculated by how much money it generates. “I’m not teaching them to draw, I’m teaching them to see”. Isn’t learning a language, too, a way of learning to see anew? I would venture to say that enhanced seeing and feeling are the real reasons to create, whether it is an exercise, a song, a haiku, or a brand new thought. A creative teacher knows how to get his/her students’ attention. and help them keep it. A creative teacher knows how to teach in ways that are meaningful to the students. A creative teacher will always find ways to make her lessons stick. Creative teachers can do all that. 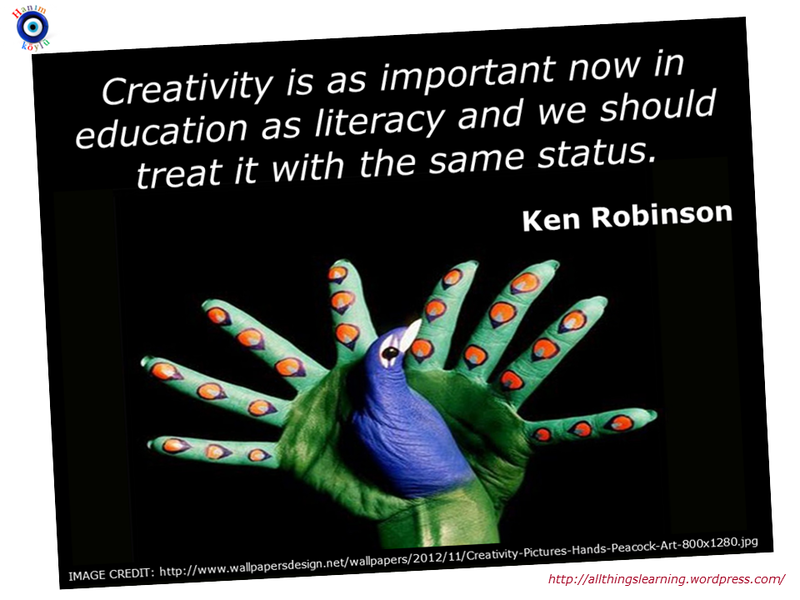 Creativity is not an optional extra for a teacher, but rather the foundations to base our practice upon. Think of the word creativity and images of imposing Renaissance men or 20th century iconoclast physics will come to mind. Well, luckily for us common mortals, the story is a little more complex than that. If you’re after a genius type of creativity and you’re wondering whether this article will make you attain the heights of a Leonardo da Vinci or Bach, I’m sorry to say that, no, it won’t. But please read on, there’s hope. If we talk about an everyday type of creativity, absolutely everyone can be creative. How can I become more creative? But what are we talking about when we’re talking about creativity? 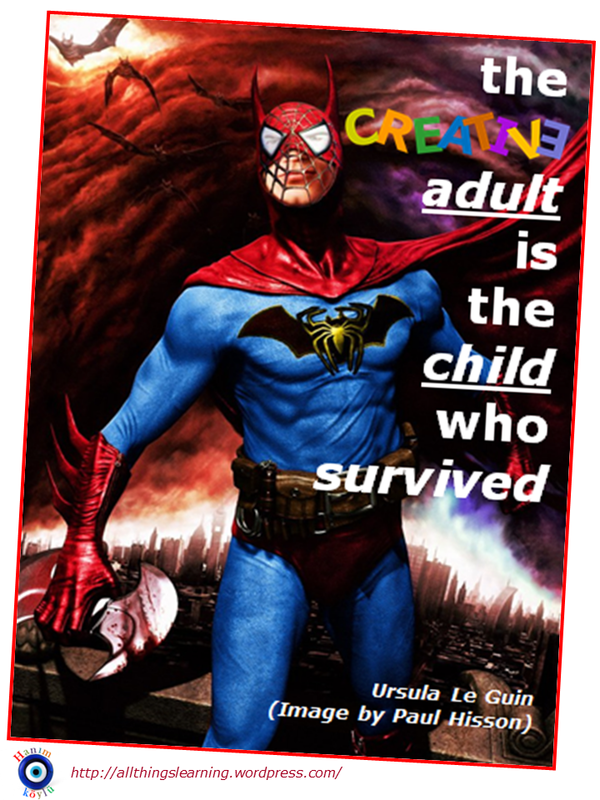 There are as many as 125 different definitions of creativity in the literature. One thing is certain, there’s more to creativity than just thinking outside the box (or divergent thinking as it is called by creativity researchers). In fact, there seems to be general consensus that rather than just a single trait, creativity is best thought of as a cluster of skills used to produce an idea that is novel and culturally appropriate or valued. There’s another definition I have always liked by professor Robert Sternberg, perhaps the world’s leading researcher in the field. For him, creativity is a decision we take. Wanting to be more creative is the main drive, the rest is up to hard work. A few years ago a few hundreds school kids in the UK were asked to name the qualities they thought a top teacher should have. What came first was ‘originality’, followed by ‘fairness’. This is hardly shocking news: great teachers have known all along that you can’t teach anyone anything if you haven’t managed to get through to them. And the best way to get our students’ attention is through a surprise: yes, kids like to be surprised (but don’t we all? ), and anything that smacks of routine is bound to fail. So, a surprise gets us attention. Interestingly, this seems in line with neurobiology research findings on the quality of attention: one of the four factors that has an impact on attention, and gets the students in a state of mental arousal is novelty (the three others are a perceived need, meaning, and emotions). Without creativity, we wouldn’t be able to come up with any surprises. Without creativity, we wouldn’t be able to cater for the great diversity of our classrooms: mixed levels, mixed intelligences. 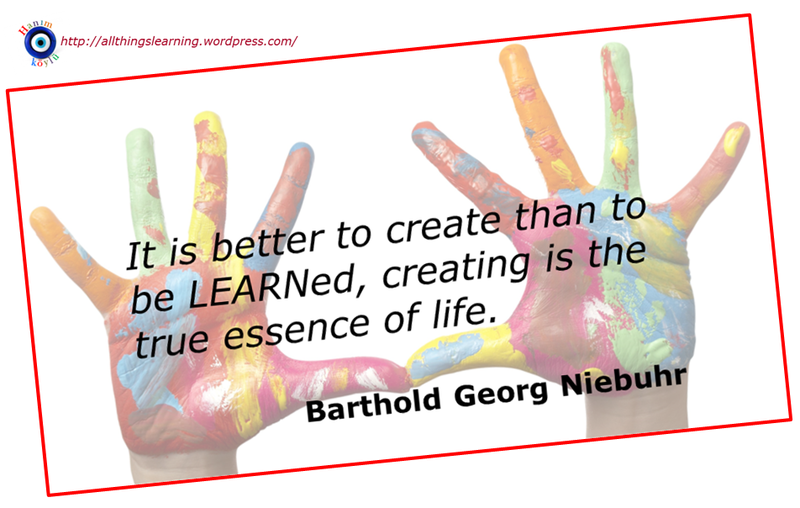 And without creativity, we wouldn’t be able to inject new life in the coursebook, either. How can I become (more) creative? 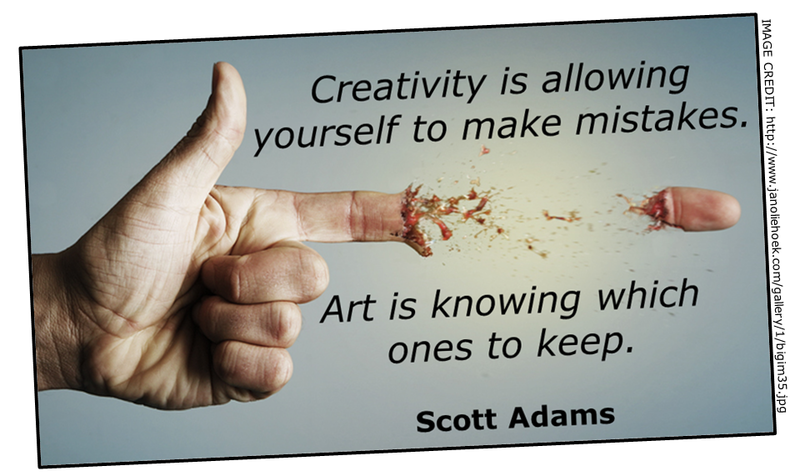 The idea that creativity is a gift bestowed upon a few select ones by the gods above is one of those myths that tend to stick around for a long time. Just like intelligence, creativity is not a fixed, unitary trait, and can be in fact developed. But creativity needs to be invited, welcome, embraced. There is a myth about the creative soul that if you don’t feel inspired, you don’t have it. I’ve been a musician for 30 years and if I had to depend on my inspiration every time I picked up my guitar, the guitar would stay mute. I’ve experienced every emotion imaginable when I play—from abject terror to sheer frustration to feeling absolutely nothing—and through it all like a recalcitrant mule, I have plodded on. Cherish the company of creative people around you. Engage them in conversation, ask questions, tease them. Seize the moment. Always keep a notepad and a pencil ready. When an idea strikes, don’t EVER brush it aside thinking you’ll remember it later. You won’t. That’s not the way our brain works, once that synopsis is gone, it’s probably gone forever. Is there a time of the day that seems to be conducive to better thinking? If so, try to stick to it. Don’t be disappointed if what had seemed a great insight doesn’t lead to much. Put it on the back burner, you’ll come back to it later. Sometimes an idea needs a good incubation period. Nurture it, take it apart, play around with it. Play, play and play. Take baby steps. You’re not out there to blaze new trails, or revolutionize the ELT world. Just keep telling yourself that every little bit helps. Fail, but fail better each time, to quote Beckett. Value feedback, but believe in what you do and persevere. Charlie Parker was mercilessly booed off the stage for playing something new. Negative reactions didn’t stop him from pressing ahead and become the greatest jazz musician who ever lived. Take sensible risks. Remember: learners like to be surprised, but they certainly don’t like to be shocked. 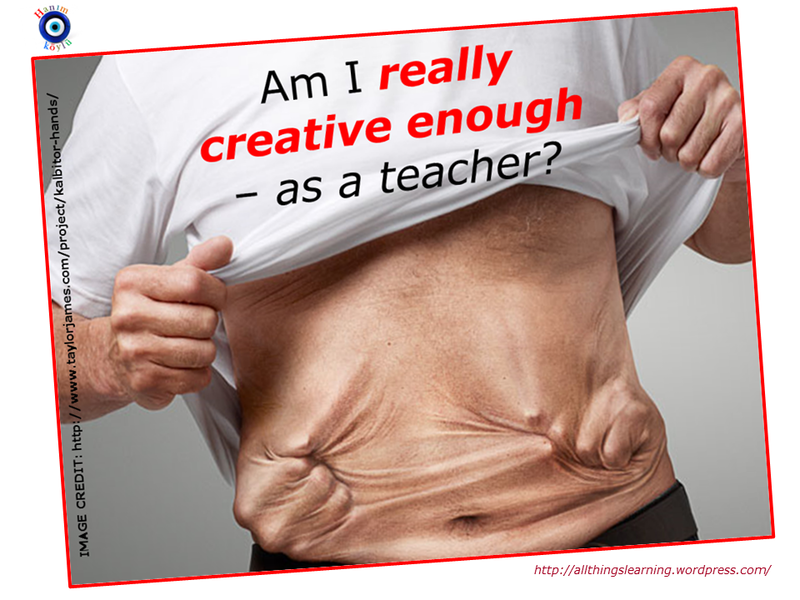 So here’s what I’d like to see: creativity training in ALL Teacher Training programs, from the newly-initiated or the inexperienced all the way up to MA level!